Bland, unattractive and cookie-cutter? Try modern, elegant and surprising. These incredible remodels transcend all stereotypes about apartment and condo designs with unexpected materials like galvanized steel, design tricks that make small spaces appear bright and open and a masterful balance of vintage and contemporary. This minimalist, monochromatic metal apartment design in Moscow uses repetitive geometric shapes to add interest to what might otherwise feel like a cold and rather unwelcoming design. 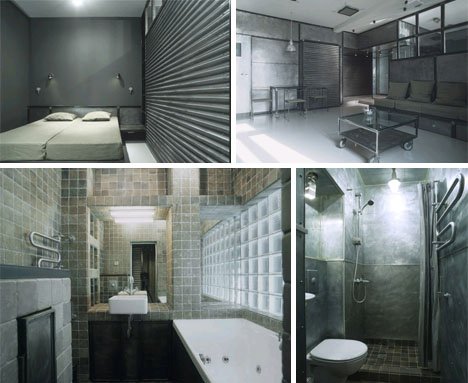 Remodeled by architect Peter Kostelov, the apartment is made almost entirely out of industrial materials in shades of black and gray with corrugated steel, visible welds and exposed rivets adding a little texture to this living space. To some, this apartment remodel may appear unfinished, but for those who find beauty in simplicity, it’s perfect just as it is. 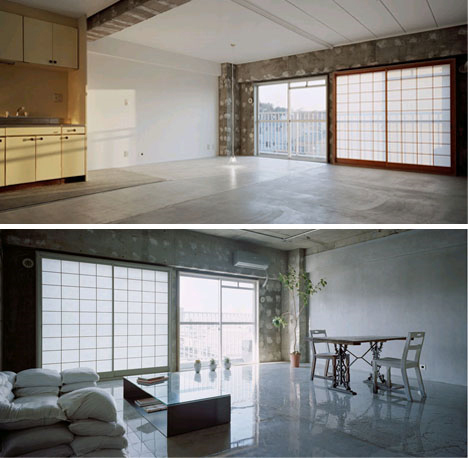 Once a warehouse building, this Tokyo loft was redesigned by Schemata to reveal the bare bones of the space and revel in the contrast between polished, modern surfaces and the raw, aging architecture. Tiny apartments with low ceilings can feel stifling and cookie-cutter, but the architects of A.A. 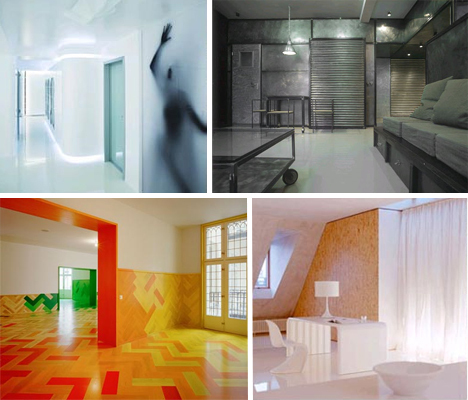 Studio certainly gave this space personality and a sense of airiness with an unusual, surreal apartment redesign approach involving lots of white. Curved corners, built-in bookcases, reflective surfaces, patterned lights and niches make the space feel larger and also strangely timeless. Inspired by the snow-and-glacier-capped mountains of Lucerne, architect Gus Wusterman remodeled this small apartment into a simple white living space that is somehow warm despite its chilly origins. With strategically placed wood panels and lots of built-in surfaces including a tier of stairs leading to a rooftop deck, the design makes the space feel more like a landscape than a set of individual rooms. 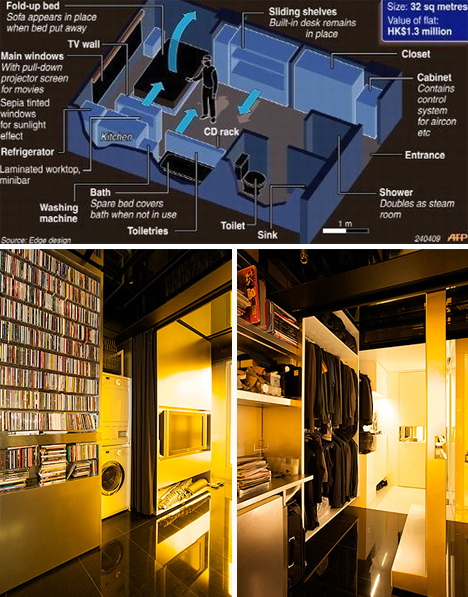 Remodeling a 350-square-foot apartment-turned-condo on a budget, Gary Change somehow managed to create a luxurious space that transforms into 21 different layouts through the use of sliding walls, fold-down desks and other movable architectural elements. Simply by folding, unfolding and sliding some elements around, Change creates a steam room, home cinema, a guest bedroom and more. Instead of making furniture and décor the focal points in a living space, why not do the opposite? 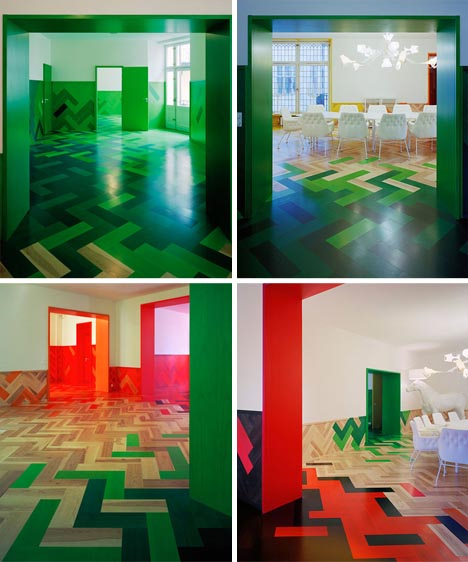 This vibrant apartment design by Tham and Videgard Hansson gets all of its visual interest from the strategic use of color and pattern, with shades that shift from autumnal reds to cool blues to create different moods in various rooms. 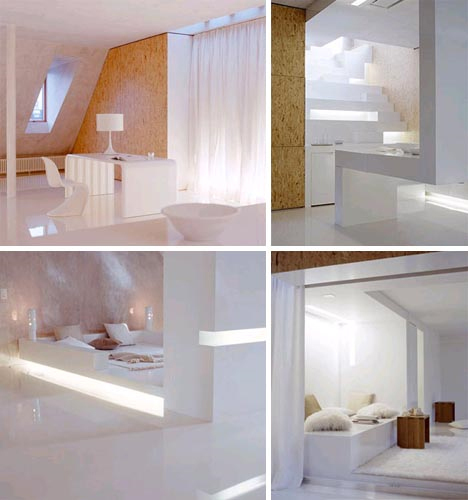 White furniture keeps the overall look of the apartment from being too busy. The juxtaposition of bright white surfaces with warm wood, especially when combined with metal and glass, can make a space look modern and luxurious – but achieving that effect doesn’t have to be expensive. 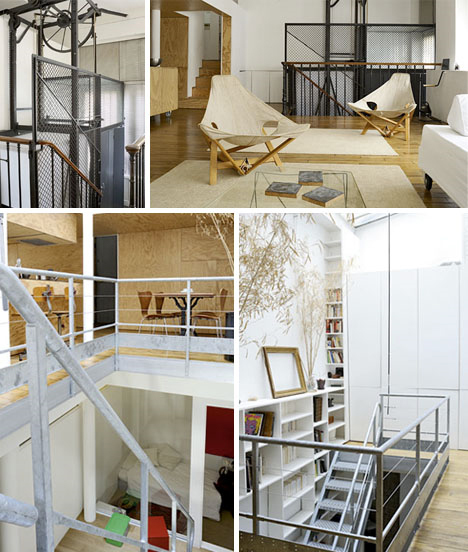 Chart.Corb renovated this loft in Paris using affordable materials like plywood to create a cozy, contemporary living space that is simple without being stark. Remodeling an unused space into a historic apartment is much easier when the space that you start with has as many beautiful features as this. 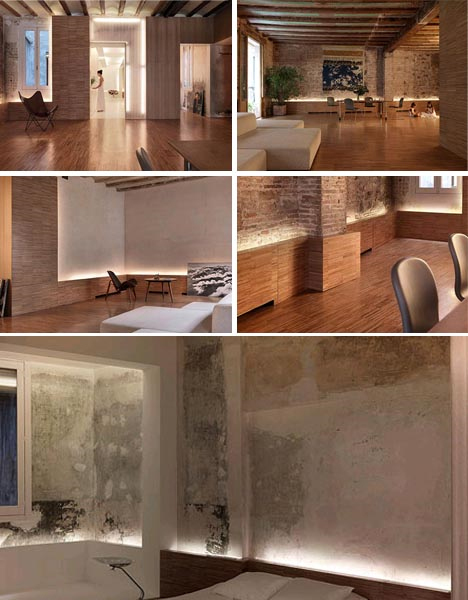 Unfinished walls, peeling paint, concrete surfaces and exposed brick hardly look unkempt when finished with wood floors, white partitions and modern furniture. Designed by Gus Wusterman, this apartment is thoroughly modern, yet retains a vintage feel brimming with texture and character. With its many desirable architectural features – from high ceilings to an open floor plan – it’s no surprise that a place of worship would make such a fantastic conversion into a loft. 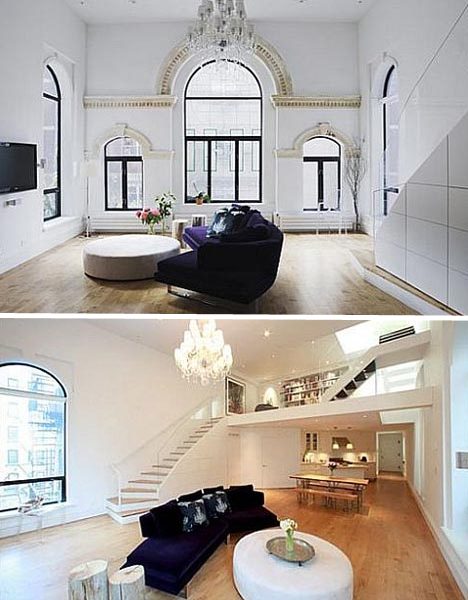 This East Village project by Manifold transformed a synagogue into a beautiful three-story private residence that is a shining example of adaptive reuse.